This isn’t a proper review of Atwood’s famous novel but some of my impressions and reactions to it and a brief summary. 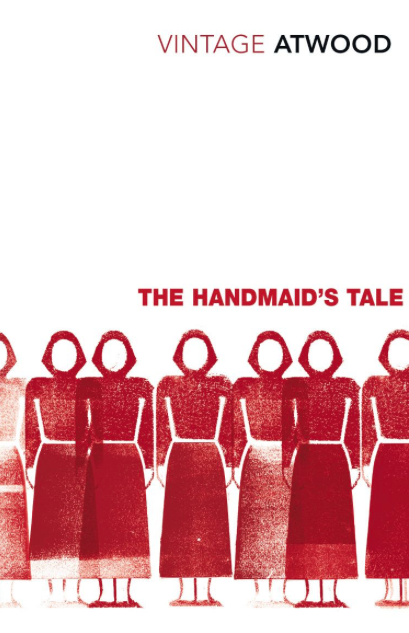 Since the US election, the sales of books like 1984 and the Handmaid’s Tale have risen. 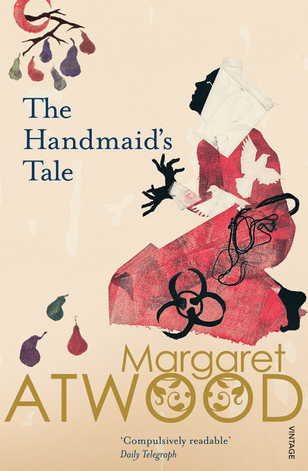 While I had read the former, I hadn’t read Margaret Atwood’s novel. In many ways it wasn’t what I expected at all. It’s interesting, complex, and clever but I don’t think it’s a book I’ll read again. There are amazing observations, long quotable passages, but as a whole, I found it dull. Even so, reading it infuriated me, which certainly proves that it’s a powerful book. Interestingly though, the element that triggered this response is an element that I haven’t seen mentioned in any of the reviews I’ve come across but it’s something that is essential to totalitarian and oppressive societies. The aspect I’m referring to is the instrumentalising of the oppressed. No matter what toxic system/government/injustice, it is hardly ever maintained without the help of the oppressed. This complicity of the oppressed is something that infuriates me in real life so much that I couldn’t overlook it. The fact that people don’t mention it, shows how astute Atwood’s depictions were. Just like in real life, it’s something so upsetting that it’s like a blind spot. 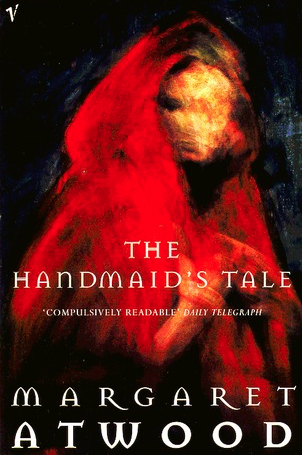 What is The Handmaid’s Tale about? The book is set in a near future, in the state of Gilead, formerly known as United States of America. A series of ecological disasters and war have led to its people being mostly sterile. After a coup, a totalitarian group of fanatic Christians has taken power. Women are divided into groups. Those married to government officials, those who breed for those who can’t have children and those who are used in other ways – sent to the colonies where they will discard toxic waste, or those used to make the system work, instruct the breeding women. 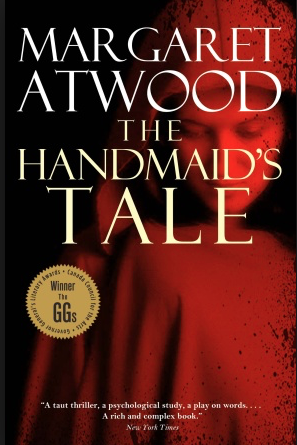 Offred, the narrator, is one of the Handmaid’s, destined to breed. At the time when the story is set, this whole system is new, so women like Offred are the first of their kind. What makes their fate particularly harrowing is that they knew a “before”. They used to live normal lives that were pretty much the same lives we still live today. That life ends when their bank accounts are closed and all their money and belongings go to their husbands. Those who’ve had children are then ripped from their families and assigned to rich couples who can’t have children. Offred describes her life in minute details. They don’t have any freedom at all. They are all dressed the same and basically not allowed to do or say anything, unless it’s according to the new laws. Public executions are a means to make everyone obedient. But there’s an underground movement and, as it seems Offred met one of the women of this movement. I’ll stop the summary here because if you’ve not read it you might enjoy finding out, how this story is told. It’s structure is one of the best things and the only element that contains a glimmer of hope in an otherwise dark and depressing tale. Obviously, reading about a world in which women are owned by men and have no freedom whatsoever, is scary and infuriating but that’s nothing compared to the fact that women are in charge of the “training” of the handmaids. The way in which Atwood portrays how this system is regulated and reinforced is so clever. There is more than one kind of freedom, said Aunt Lydia. Freedom to and freedom from. In the days of anarchy, it was freedom to. Now you are being given freedom from. Don’t underrate it. The quote shows that some women accept the explanations given by the government. They also accept to be the instrument of the government. In some instances because they believe that women are, in many ways better off than before, but also because becoming executors, helps them to escape either death or being worked to death in one of the toxic landfills. Why is it that victims enforce the system that exploits them? Fear and self-preservation are some of the reasons, but there’s also something far more toxic – they have internalized the system. The Handmaid’s Tale is bleak but there’s a glimmer of hope, as I mentioned before. While some of the oppressed help keep up the system, there are many who plot an uprising. Before ending this post, I’d like to mention one other aspect that I found chilling. One reason why women were so easily disempowered was because pre-Gilead society didn’t use cash but only credit cards. That way it was easy to stop the women’s access and transfer their money to their husband’s account and to disempower them completely. They didn’t even have enough cash to buy a ticket to somewhere else and escape. I found this chilling because I know a great many people who say that we are moving away from cash and to the exclusive use of cards/online banking etc. 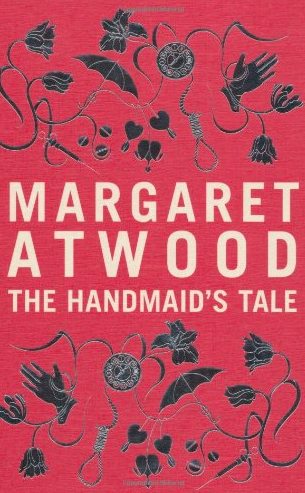 When The Handmaid’s Tale was published, readers thought that Atwood depicted a Muslim society. Maybe she did. I think we shouldn’t read it like that. We should read it as a portrayal of the belief system and the functioning of a totalitarian government. Thinking that she wrote about a Muslim society is something we cannot afford. It can happen in other societies as well. Now on to something different. Look at those covers! And I haven’t even posted all of those I found. Mine is the one on the far left. It’s not my favourite. The one I’m most familiar with is the second to the left, the one I like the most is the fifth from the left but I actually find the first and the last to do the book more justice. Do you have a favourite? Dear Caroline, Thanks so much for your post! If it weren’t for the lively resistance to the new American President (I avoid mentioning his name whenever possible), we’d be headed this way right now. As it is, it seems a pitched battle between a form of Gilead and more reasonable people. I don’t know if you know just how timely your post is, but they’ve started something with this book; I saw it advertised on tv, and I can’t recall whether it’s to be a regular, episodic tv show or a movie. But at any rate, your post is quite timely. You’re very welcome. I didn’t know about the adaptation when I picked up the book but I found out later. I NEVER name him. He will and shall be called “he who shall not be named”. I agree about the resistance although I fear he might still undo the fabrics of the US democracy. One sneaky way or another. This book is so actual these days – it descripes the world, which the man and the man who shall not be named want to create. We have to resist! And fight for democracy and women`s rights. Absolutely. It’s very disheartening to see that whenever democracies fail or change for the worse, women are among the first to suffer. As you say, we have to resist. I also read this for the first time recently, having meant to read it for ages. I also found some of it dull, and also infuriating! I thought it was brilliantly clever, but I ultimately found it unsatisfying. It’s great to hear what someone else thinks of it! I’m interested to see what the Hulu TV adaptation is like. 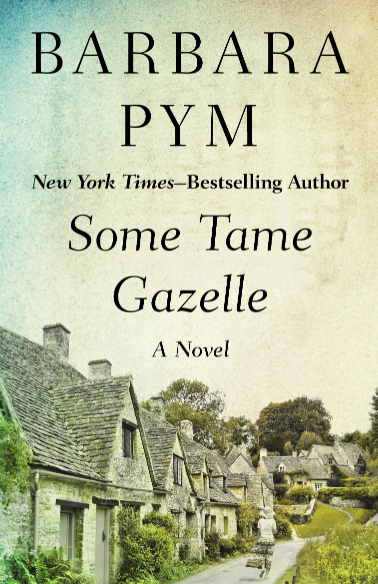 If you feel like reading it, I reviewed the book over on my blog too. Thanks for the great post! We did really have a similar reaction. That’s interesting to know. I hope I’ll get a chance to watch it. I wonder what they will emphasize. I’ll visit as soon as I get a chance. Thanks for the post! I’ve seen the Robert Duvall movie several times (it’s on youtube), but haven’t actually read the book. Now I really want to read it — as always, books have more nuance and depth than their film counterparts. As for 1984, I’ve owned it and read it several times. In terms of dystopian fiction, definitely read Brave New World… I identified with it more than 1984. Especially with the oversexualized and drugged society. Take care! Hope you have a great week! My pleasure. I need to watch the movie. I remember my mother watched it years ago and couldn’t stop talking about it. I’m glad I’ve read it. While I had some reservations, it’s clearly an important book. I’d be interested to hear what you think of it. I forgot to mention Brave New World. It was the first of the three I read while I was still in school, so my memories are fuzzy but, it spoke to me too. I’d say it’s the one I prefer of the three. I wish you a great week too. The cover on the far right (top shelf) shows piercings? Does that happen in the book? No, it doesn’t. It’s purely symbolic. They aren’t really allowed to speak. It is a very long time since I read this but I understand your reactions to completely. I felt similarly infuriated with The Handmaid’s Tale and Nineteen Eighty Four. I don’t think I could read either of them just at the moment though. I read it at the beginning of January. I feel much more affected by everything now, so I would pick it up anymore. Interesting to hear that you had a similar reaction. It has so many infuriating elements. Like Ali, I can relate to your response to this novel even though it’s been a while since I read it myself. It’s a book that tends to spark a lot of debate which is no bad thing in some ways. Funnily enough, my sixteen-year-old goddaughter has just been given a copy so I wonder how she’ll find it. It was one of tise times when I wished I was in a book club and we’d read it there. Some of my writer’s group picked it up after I mentioned it and reactions were so different. Great post Caroline. It’s a long time since I read this, but you’ve picked up on one of the elements I remember most strongly and which I found most scary – the financial disempowering by the credit cards. I often choose to purchase using cash when I can nowadays because I figure someone, somewhere is tracking what I buy on cards and building up a profile… paranoid, moi????? Thanks, Karen. You are not paranoid. Everything is tracked. Especially when you buy online. Apparently some companies can even adjust prizes. I find the cash bit so scary because it could happen. And then what? I’m just saying hacking and all that. You hit on a point that has always bothered me: collaborators. No matter what the situation, be it war or something domestic like what is described in Atwood’s novel, the idea of a small group profiting from the exploitation of the group of which they are a part is often the most disgusting aspect of the situation. I find it hard to get into the heads of anyone who would do such a thing. By the way, I see that you are currently reading “The Thief.” I read that one a while back and really enjoyed the inside look at Japan’s crime culture, even though I remember the plot being a bit on the noirish side. 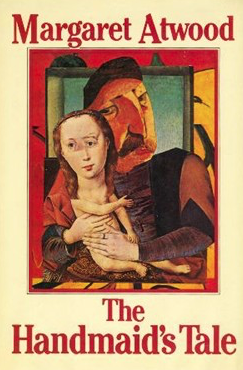 But I love the exaggerated, darker side of any society in crime novels, so “The Thief” has stuck in my mind. I find that very disgusting too. I didn’t add any comparisons but there are many. These systems work so well because of this. I can only imagine that excessive fear leads to that. I was so surprised to find out that The Thief is actually noir, I always saw it mentioned as a thriller or crime but it’s so much more noir. But so different from what I’m used to. Let me know what you think of “The Thief”…I’ll be looking forward to your review. I have a review backlog at the moment but I should get to it soon. I was struck right away by all the red in the covers. Fascinating post! The red is striking. I’m curious to see what it looks like in the movie/TV adaptation. This book made a great impression upon me when I read it. The story also made me angry. At the time, I thought that I saw the forces in American society that could bring this about. Sadly, I believe that those forces are stronger now. I never heard this compared to an Islamist society but it can work as a critique there also. I know that there is a new series coming out based upon this book. I thought that the original film was also excellent. People read it as criticism of the Taliban and there is a resemblance but it goes further, I’d say. I agree with you, something very similar could happen in the US. Unfortunately, in a more sneaky way. Everyone needs to stay alert, watch and resist. Thanks. I appreciated it but didn’t like it. I also seem to have expected more. Not sure what though. I think similar things can happen. It’s decidedly horrific. 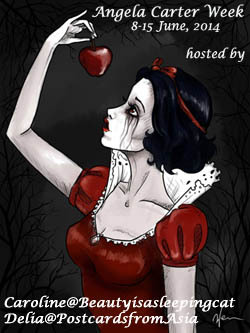 My cover is closest to the second one you’ve chosen, but more white so that the handmaids’ garments seem starker. I’ve always coveted the Folio edition of the book, but I remain partial to my copy simply because I’ve read it so many times. I liked the movie a lot, too, but I am very keen to see the new one: the trailer looks amazing. Somewhere I saw, in a newsletter, some amazing stats about the sales of this volume since the inauguration in the US, and the author’s comments on that phenomenon. I’m positive that MA wishes that nobody was still marvelling at how prescient she was, wishes that things were looking very different. I don’t think I know the Folio edition but they are generally so nice. I don’t think I could reread thus unless I would gave to study it for one reason or the other. I wonder if there’s also a rise in sales on books on the Nazi regime. I get it why 1984 and this are read so much now. Some things are eerily similar. Yes, I’m sure she would be glad if things were different. I read this book a long long time ago, but it has stayed with me. So depressing. 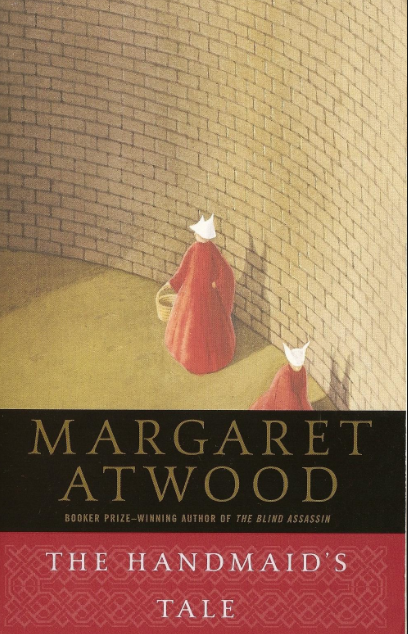 I read this a long time ago, and it’s not my favorite of Atwood’s books. But one of my reading goals for the year is to reread it. Not sure if I’ll be able to stomach it given the state of things! I read a news article about a proposed law bill in Oklahoma in which the bill’s sponsor called pregnant women “hosts.” The bill would make it so that women would have to get a man’s permission to have an abortion. I can’t even believe that this is a real proposal. I don’t know how we’ve gotten to this point, but it’s very scary. That’s awful about that law bill. Shocking really. In Russia they just changed the law. Domestic abuse is no longer a crime. While these two thin gs are different, they still show that women are among the first targeted when democracy is at risk. Which was you favourite Atwood? I’ve only read Surfacing and Cat’s Eye so far. I liked them both a great deal. I want to read more of her. I’d be interested to hear how you’ll think about it the second time. Those are excellent books. My favorites are Alias Grace and Cat’s Eye. It’s been years since I’ve read The Edible Woman and The Robber Bride. I’d like to reread those. 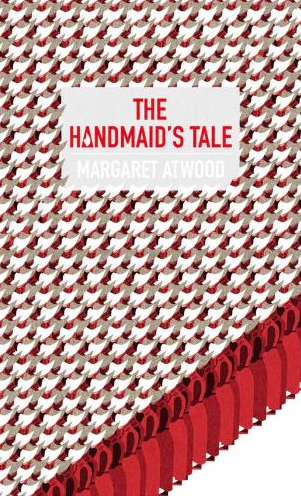 Yes, when I reread Handmaid’s Tale I’ll write about it! I’ve got a pile with her books. I’m glad Alias Grace is on it. I also own The Edible Woman. That will probably be my next one. I’m looking forward to your review. This book has stayed with me for years. Chilling, indeed. Especially in these times. A television series is about to air in the US. I like that cover better than mine. I would love to watch the series. It’s very chilling.